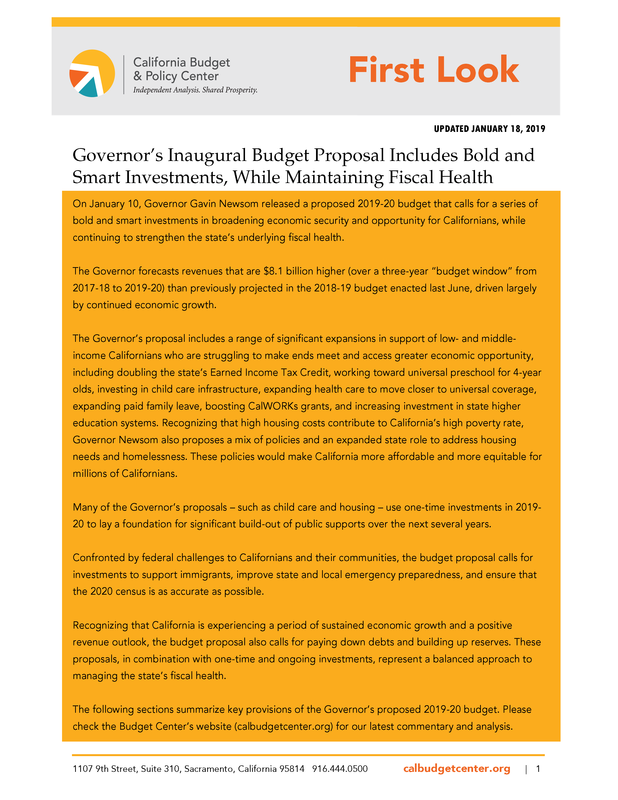 On January 10, Governor Gavin Newsom released a proposed 2019-20 budget that calls for a series of bold and smart investments in broadening economic security and opportunity for Californians, while continuing to strengthen the state’s underlying fiscal health. The Governor forecasts revenues that are $8.1 billion higher (over a three-year “budget window” from 2017-18 to 2019-20) than previously projected in the 2018-19 budget enacted last June, driven largely by continued economic growth. The Governor’s proposal includes a range of significant expansions in support of low- and middle-income Californians who are struggling to make ends meet and access greater economic opportunity, including doubling the state’s Earned Income Tax Credit, working toward universal preschool for 4-year olds, investing in child care infrastructure, expanding health care to move closer to universal coverage, expanding paid family leave, boosting CalWORKs grants, and increasing investment in state higher education systems. Recognizing that high housing costs contribute to California’s high poverty rate, Governor Newsom also proposes a mix of policies and an expanded state role to address housing needs and homelessness. These policies would make California more affordable and more equitable for millions of Californians. Many of the Governor’s proposals — such as child care and housing — use one-time investments in 2019-20 to lay a foundation for significant build-out of public supports over the next several years. Confronted by federal challenges to Californians and their communities, the budget proposal calls for investments to support immigrants, improve state and local emergency preparedness, and ensure that the 2020 census is as accurate as possible. Recognizing that California is experiencing a period of sustained economic growth and a positive revenue outlook, the budget proposal also calls for paying down debts and building up reserves. These proposals, in combination with one-time and ongoing investments, represent a balanced approach to managing the state’s fiscal health. The following sections summarize key provisions of the Governor’s proposed 2019-20 budget. The Governor’s proposed budget assumes that the current economic expansion continues in the near-term, albeit at a more moderate pace than in recent years. Specifically, the Administration projects that national economic growth, as measured by the change in Gross Domestic Product (GDP), will begin to moderate this year and then gradually slow each subsequent year through 2022, the end of the forecast period. The Administration also expects economic growth to slow in California during this period. In terms of California’s labor market, the Governor’s forecast assumes steady job growth that continues to increase the state’s labor force participation rate and maintains the state’s unemployment rate at historically low levels. The forecast notes that low unemployment in 2018 failed to translate into significant wage increases thus far, other than for high-income earners, but anticipates that more workers will begin to see real wage increases this year. The proposed budget summary outlines several risks to the Governor’s projections for California’s economic growth. These include a number of national factors, such as a large drop in the stock market, which has been experiencing significant fluctuations since last year; a national recession, which could come at a time when many people have not yet recovered from the previous downturn and when the federal government is not well-positioned to ramp up spending to mitigate its damage; and the ongoing trade war with China, California’s third-largest trading partner. Additionally, the Governor’s forecast notes that California will need to address the aging population, declining birth rates, and insufficient housing supply in order for the state’s economic growth to continue. The proposed budget assumes increases in revenues over the three-year “budget window,” from 2017-18 to 2019-20, while acknowledging that rising risks to the state’s economic outlook could affect the revenue forecast. The Governor’s proposal projects General Fund revenues for the budget window to exceed the projections in the enacted 2018-19 budget package by $8.1 billion, before accounting for transfers such as deposits into the rainy day fund. This includes higher-than-expected revenues from the personal income tax (PIT) and the corporation tax (CT), partially offset by lower-than-expected revenues from the sales and use tax (SUT). Together, these three taxes are expected to comprise almost 97% of General Fund revenues in the proposed 2019-20 budget. PIT revenues are projected to be $7.5 billion higher over the three-year budget window than estimated in the 2018-19 budget agreement, reflecting strong growth in wages and capital gains, particularly among high-income taxpayers. SUT revenues are expected to be $1.4 billion lower, primarily because a spike in business investment that was anticipated due to last year’s changes to federal tax law did not occur. Additionally, the lower SUT projection reflects consumer spending restraints due to high housing costs and the continued erosion of the state’s sales tax base. CT revenues are estimated to be $1.3 billion higher over the budget window, though the budget proposal warns this is expected to be a one-time increase largely resulting from shifts in the timing of corporate tax payments. California voters approved Proposition 2 in November 2014, amending the California Constitution to revise the rules for the state’s Budget Stabilization Account (BSA), commonly referred to as the rainy day fund. Prop. 2 requires an annual set-aside equal to 1.5% of estimated General Fund revenues. An additional set-aside is required when capital gains revenues in a given year exceed 8% of General Fund tax revenues. For 15 years — from 2015-16 to 2029-30 — half of these funds must be deposited into the rainy day fund and the other half is to be used to reduce certain state liabilities (also known as “budgetary debt”). The Governor’s proposed budget includes a transfer of $1.8 billion to the BSA for 2019-20, bringing the reserve’s balance to $15.3 billion by the end of the fiscal year. Prop. 2 requires that when the BSA balance has reached its constitutional maximum of 10% of General Fund tax revenues, any additional dollars that would otherwise go into the BSA must be spent on infrastructure, including spending on deferred maintenance. However, while the BSA has reached this maximum, the Governor’s budget assumes that constitutionally required deposits will continue to be made since the account’s maximum balance was achieved in part through supplemental payments in prior years. This assumption is based on an opinion by the Legislative Counsel, but could be subject to a legal challenge. The BSA is not California’s only reserve fund. Each year, the state deposits additional funds into a “Special Fund for Economic Uncertainties” (SFEU). The Governor’s proposed budget assumes an SFEU balance of $2.3 billion. Additionally, the 2018-19 budget agreement created the Safety Net Reserve Fund, which holds funds that can be used to maintain benefits and services for CalWORKs and Medi-Cal participants in the event of an economic downturn. The Governor proposes depositing $700 million into the Safety Net Reserve, bringing the fund’s balance to $900 million. Taking into account the BSA, SFEU, and the Safety Net Reserve, the Governor’s proposal would build state reserves to a total of $18.5 billion in 2019-20. The Governor’s proposed 2019-20 budget prioritizes paying down state and local unfunded pension liabilities and paying off outstanding budgetary debt incurred during the Great Recession and its aftermath. The budget proposal includes required and supplemental contributions to two state-run retirement systems: the California Public Employees’ Retirement System (CalPERS) and the California State Teachers’ Retirement System (CalSTRS). CalPERS and CalSTRS, like many retirement systems, are not funded at levels that will keep up with future benefits, resulting in the state needing to make higher annual contributions in order to pay down unfunded liabilities. Beyond statutorily required contributions, the Governor’s proposed budget includes a $3 billion supplemental pension payment to CalPERS that would be made in the current fiscal year (2018-19). The budget proposal also devotes an additional $390 million to CalPERS in 2019-20 from Proposition 2 funds (see Reserves section) that are required to be set aside for reducing state liabilities. In the case of CalSTRS, the budget proposal devotes an additional $1.1 billion, beyond statutory requirements, toward the state’s share of CalSTRS unfunded liabilities. The $1.1 billion comes from Prop. 2 funds (see Reserves section) that are required to be set aside for reducing state liabilities. The Governor’s proposal notes that the $1.1 billion is the “first installment of an estimated $2.9 billion to be paid to CalSTRS through 2022-23” using available Prop. 2 dollars. In addition, the Governor’s proposal includes a one-time $3 billion non-Proposition 98 payment to CalSTRS to reduce the employers’ (local educational agencies and community colleges) share of unfunded liabilities in response to prior changes in contribution levels and pressures confronting employers. In 2014, the state enacted AB 1469, increasing the share of CalSTRS costs borne by all parties (the state, employers, and teachers), but particularly increasing the contribution rate of employers. Confronting a series of other pressures, including enrollment decline and increases in the costs of local services, some local educational agencies are in danger of not being able to meet their financial obligations. The Governor’s proposal would provide $2.3 billion toward the employers’ share of the unfunded liability for the CalSTRS Defined Benefit Program. The Governor proposes to use the remaining $700 million to reduce the required contributions by employers in 2019-20 and 2020-21. Overall, the proposed $3 billion supplemental payment would free up — in the short term as well as the long term — local dollars for investment in education or to allow employers to pay down retirement obligations. The Governor’s proposed 2019-20 budget also includes more than $4 billion to pay off outstanding budgetary debts incurred during the Great Recession, including $2.4 billion to eliminate outstanding loans from special funds and transportation accounts and a total of $1.7 billion to eliminate a one-month deferral of payroll from nine years ago and a deferred payment to CalPERS from over a decade ago. Subsidized child care allows parents with low and moderate incomes to find jobs and remain employed, feeling secure that their children have a safe space to learn and grow. These programs provide a critical service, keeping families across California afloat. Currently, subsidized child care programs serve far fewer children than they did ten years ago. While policymakers have made incremental investments in early care and education in recent years, investments to serve more children have been targeted to the California State Preschool Program, just one component of California’s subsidized child care and development system. Provides $245 million one-time General Fund for child care facilities. The state currently operates three programs that provide funding for child care facilities including a loan program for portable facilities, loans for facility repair and renovation, and, most recently, the new Inclusive Early Education Expansion Program funded in the 2018-19 budget agreement with $167 million in one-time Prop. 98 funding. The proposal does not indicate if this funding would augment existing facility funding programs or create a new program. Provides $245 million one-time General Fund for child care workforce development. The administration’s stated goal is to “improve the quality of care” by investing in the education of the child care providers. Details about how this will be allocated are not available. Improves and expands child care facilities on university campuses with $247 million in one-time General Fund. The proposed budget boosts resources for the California State University (CSU) in order to add more child care facilities to serve students with children. This is aligned with the administration’s proposal to also increase financial aid for student parents. (See the Student Aid section.) These funds could also be used for deferred maintenance, but it is not clear if this is deferred maintenance on child care facilities or on other CSU facilities. Provides $10 million General Fund to develop a plan to increase access to subsidized child care. As mentioned in the Early Learning section, the budget proposal also includes $10 million General Fund to pay a contractor to create a plan in the 2019-20 fiscal year to address a wide variety of issues such as universal preschool, facility capacity, workforce training, access to subsidized child care, and potential revenue options for the subsidized child care and development system. The budget proposal signals a commitment to serve more families in future years, by setting aside hundreds of millions in one-time funding for subsidized child care infrastructure in the 2019-20 fiscal year. Yet, despite this historically large proposed increase, the proposal does not provide more low- and moderate-income families with access to subsidized child care, despite years-long waiting lists. Paid family leave has the potential to benefit both children and parents, boosting health and well-being, while also providing savings for both businesses and the state. California leads the nation in paid family leave policy, but the state and the nation lag other wealthy countries in terms of the length of leave and the level of benefits. The California Paid Family Leave (PFL) program is funded entirely by workers’ contributions to the state’s Disability Insurance Program. These contributions are housed in a special fund that provides 60% to 70% of a worker’s weekly earnings based on income when a worker takes family leave. Caregivers can currently take up to six weeks of paid time off to care for a family member or bond with a newborn or adopted child. Birth mothers are generally allowed another 6 weeks to recover from the birth, for a total of 12 weeks. The Governor’s proposed budget expresses a commitment to expand the PFL program to six months in future years. In the upcoming fiscal year, the proposed budget would adjust the reserve requirement for the special fund that pays PFL claims. As stated in the proposed budget, this would ensure that the fund’s reserves are not depleted when the PFL program is expanded in the future. The administration also plans to convene a task force to study different options for expanding the program, including for caregivers with low-incomes who may not be able to afford to take time off of work to care for their family. Last year’s 2018-19 budget package instituted a new home visiting initiative in the California Work Opportunity and Responsibility to Kids (CalWORKs) program, beginning on January 1, 2019. The program will provide up to 24 months of evidence-based home visiting for CalWORKs parents who are either pregnant or parenting a child under age 2, with a priority for first-time parents. A total of $158.4 million in federal TANF and state General Fund dollars was set aside to fund home visiting for three years, after which the initiative will be subject to annual appropriation as an ongoing program. Of this total, $29.2 million was budgeted for the current 2018-19 state fiscal year (which began July 1, 2018). Governor Newsom’s budget proposal allocates $78.9 million of the remaining funds for the 2019-20 budget year, leaving $50.3 million reserved for 2020-21. In addition, the Governor calls for $23 million General Fund to expand home visiting programs outside of the CalWORKs program. Currently, the Department of Public Health receives federal funding to administer home visiting programs for pregnant and newly parenting families who are at risk for adverse childhood experiences. The proposed $23 million represents the state’s first financial investment in home visiting for non-CalWORKs families. The budget proposal also includes $7.5 million to increase participation in the Black Infant Health program, which aims to improve African-American infant and maternal health through group support services and case management. A Child Savings Account (CSA) is an account established for children as early as birth that builds assets over time. CSAs are generally seeded with an initial deposit from a government agency or another sponsoring organization, then built with contributions from family, friends, or the child. Once the child reaches adulthood, the savings are typically used for higher education, though they can also support homeownership or other asset-building investments. In the budget proposal, the Governor provides a one-time investment of $50 million General Fund “to support pilot projects and partnerships with First 5 California, local first 5 Commissions, local government, and philanthropy” to increase access to CSAs among incoming kindergarteners. The proposed budget suggests these accounts could be used for post-secondary education expenses, such as tuition, room and board, books, supplies and equipment, and mandatory fees. The California Earned Income Tax Credit (CalEITC) is a refundable state tax credit that helps low-earning workers and their families make ends meet. The credit was established by the 2015-16 budget agreement and was modestly expanded twice in recent years. Currently, the CalEITC provides up to nearly $2,900 as a state tax refund, depending on how much families earn and how many children they support. Extends the credit to an estimated 400,000 additional tax filers by allowing those with somewhat higher incomes (who are still low-income) to claim the credit. The maximum annual income for filers eligible to claim the credit would be increased to about $30,000 – roughly equal to full-time, year-round earnings for a worker earning $15 per hour, which will be the state’s minimum wage as soon as 2022. Currently, the annual income limit for families with children is about $25,000 and for workers without dependent children it is just under $17,000. Proposes to explore providing a monthly payment option for workers who qualify for the credit. Specifically, the Administration proposes exploring “how to allow workers to receive a portion of their [credit] in monthly payments,” rather than as an annual lump sum. These changes are projected to reduce state personal income tax revenue by $600 million, bringing the total cost of the credit to an estimated $1 billion. To offset this revenue loss, the Governor proposes that California conform to “several federal tax law changes mainly impacting business income.” When states conform to federal tax law provisions they adopt those provisions as part of the state tax code. California has the ability to choose which provisions of federal tax law the state will conform to, which gives state policymakers the ability to decide on a case-by-case basis which provisions of federal law they believe are sound tax policy and would benefit California if the state adopted them. The Administration proposes conforming to several provisions “that on either administrative burden or policy grounds are clearly beneficial to California.” These include “flexibility for small businesses; capital gains deferrals and exclusions for Opportunity Zones; and limitations on fringe benefit deductions, like-kind exchanges, and losses for non-corporate taxpayers; among others.” The Administration expects these conformity provisions to raise $1 billion in 2019-20. The proposed budget also includes $5 million one-time General Fund “to provide matching funds to nonprofits, community-based organizations, or governmental entities that provide increased awareness of the California Earned Income Tax Credit and free tax preparation assistance to eligible families and individuals.” The 2018-19 budget package included $10 million General Fund to support community based efforts to promote the CalEITC and evaluate those efforts as well as to support organizations that provide free tax preparation services. The California Work Opportunity and Responsibility to Kids (CalWORKs) program provides modest cash assistance for over 775,000 low-income children while helping parents overcome barriers to employment and find jobs. The annualized maximum CalWORKs grant for a family of three has been well below the deep-poverty threshold (50% of the federal poverty line) for the past 11 years. In the 2018-19 budget package, the previous administration took the first of three proposed steps to raise the maximum grant to the deep-poverty threshold over three years, beginning with $90 million for a 10% grant increase beginning April 1, 2019. Governor Newsom’s 2019-20 proposal calls for an additional 13.1% increase, which would raise the maximum grant to 50% of the federal poverty line effective October 1, 2019. To fund this increase, the proposed budget allocates $347.6 million General Fund for the 2019-20 fiscal year (which begins July 1, 2019), with $455.4 million General Fund as the annual, full-year cost. More than half of California renter households pay more than 30% of their income toward rent, making them housing cost-burdened, and high housing costs are a key driver of California’s high poverty rate. The Governor’s budget proposes a multi-pronged state-level approach to address California’s housing affordability crisis, including regulatory changes, one-time planning and incentive funding, and an ongoing expansion of tax credits that finance affordable housing development. HCD would also play a more active role in reviewing local housing plans and enforcing housing goals and production. In addition, the Administration proposes “linking housing production to certain transportation funds and other applicable sources,” suggesting that some types of state funding would become available only to local jurisdictions that are demonstrating progress toward housing production goals. The budget also includes $500 million General Fund one-time to support the construction of housing for moderate-income households through the existing Mixed-Income Loan Program, administered by the California Housing Finance Agency. As another strategy to increase housing production, the Administration proposes to make excess state property available for affordable housing demonstration projects, providing developers with low-cost, long-term ground leases for state-owned land on which they would build affordable and mixed-income housing using “creative and streamlined approaches,” such as modular construction. Finally, the Governor’s budget plan proposes encouraging housing development by incentivizing the use of economic development tools including Enhanced Infrastructure Financing Districts (EIFDs) and Opportunity Zones (OZs). After the dissolution of redevelopment agencies in 2011-12, a newer state law allows cities and counties to create EIFDs to finance infrastructure, including affordable housing, with property tax revenue from consenting local taxing agencies, with the exception of school or community college districts. Under current law, EIFDs can issue bonds to fund projects but must get approval from 55% of voters. The Governor’s budget proposes to eliminate the 55% voter approval requirement to issue bonds to make the creation of EIFDs more attractive. In addition, the Governor proposes aligning EIFDs with OZs, which are primarily economically distressed census tracts that have been selected by the state pursuant to last year’s federal tax law. Taxpayers that make investments in these zones, which may include but are not limited to housing development or rehabilitation, qualify for deferred and reduced federal capital gains taxes. The Governor’s proposal would provide similar deferrals and reductions in state income taxes for investments in affordable housing in OZs. $300 million General Fund one-time funds to support expansion or development of emergency shelters and navigation centers, available to jurisdictions that establish joint regional plans to address homelessness. $25 million General Fund ongoing to continue support for the Housing and Disability Advocacy Program (HDAP), which assists homeless individuals with physical or mental disabilities in applying for federal Supplemental Security Income (SSI) disability benefits by providing outreach, case management, benefits advocacy, and housing supports. The 2017-18 budget had included one-time funding of $45 million over three years for this program. $100 million General Fund one-time funds with multi-year spending authority, administered through the Department of Health Care Services, to support Whole Person Care Pilot programs that include housing services. These programs provide coordinated health, behavioral health, and social services and often target individuals who are homeless or at risk of homelessness and have a medical need for housing and/or supportive services. Developing a statewide policy to allow emergency shelters to be developed on state land located within the state’s highway right-of-way limits but used for nontransportation purposes (known as Department of Transportation, or CalTrans, “airspace”). This proposal would expand a 2018 policy that allowed for emergency shelters to be sited on CalTrans land in a few cities throughout the state. Finally, the Governor proposes accelerating awards for housing development projects that qualify for funds from two bond measures approved by voters in November 2018 – the No Place Like Home Act (Proposition 2 of 2018), which provides funds to develop supportive housing for individuals with mental illness who are homeless or at risk of homelessness; and the Veterans and Affordable Housing Bond Act (Proposition 1 of 2018), which provides funds that can be used for development of supportive housing, among other types of housing projects. Supplemental Security Income/State Supplementary Payment (SSI/SSP) grants help well over 1 million low-income seniors and people with disabilities to pay for housing, food, and other basic necessities. Grants are funded with both federal (SSI) and state (SSP) dollars. State policymakers made deep cuts to the SSP portion of these grants in order to help close budget shortfalls that emerged following the onset of the Great Recession in 2007. The SSP portions for couples and for individuals were reduced to federal minimums in 2009 and 2011, respectively. Moreover, the annual statutory state cost-of-living adjustment (COLA) for SSI/SSP grants was eliminated beginning in 2010-11. Since then, state policymakers have provided only one discretionary COLA for the state’s SSP portion of the grant — a 2.76% boost that took effect in January 2017, resulting in monthly state SSP grant levels of $160.72 for individuals and $407.14 for couples, which remain in effect today. The maximum monthly combined SSI/SSP grant for individuals who live independently would increase from the current level of $931.72 to $950.72 on January 1, 2020. This projected 2020 grant level equals 93.9% of the current federal poverty guideline for an individual ($1,012 per month). The maximum monthly combined SSI/SSP grant for couples who live independently would increase from the current level of $1,564.14 to $1,593.14 on January 1, 2020. This projected 2020 grant level equals 116.1% of the current federal poverty guideline for a couple ($1,372 per month). In addition, the Governor proposes to make permanent a state-funded food benefit that will be provided to certain households with SSI/SSP recipients — households that would otherwise be harmed by a recently adopted state policy. Specifically, the budget package for the current fiscal year (2018-19) ended California’s SSI “cash-out” policy, which prohibits people enrolled in SSI/SSP from receiving federal food benefits provided through the Supplemental Nutrition Assistance Program (SNAP), which is called CalFresh in California. Under this new policy, SSI/SSP recipients will become eligible for CalFresh food assistance as soon as June 1, 2019, or no later than August 1, 2019, depending on how rapidly the state can implement this change. Ending the SSI cash-out will primarily benefit households that consist solely of SSI/SSP recipients — and no one else — by allowing them to newly enroll in CalFresh. Certain other households will be harmed by this change. These households contain a mix of SSI/SSP recipients and other people with low incomes who 1) are not enrolled in SSI/SSP and 2) receive CalFresh benefits. Because of how CalFresh benefits are calculated, once SSI/SSP recipients become eligible for CalFresh, tens of thousands of mixed households will see their CalFresh benefits reduced or eliminated, according to state projections released in 2018. In order to hold these households harmless, the 2018-19 budget included temporary funding for a state-funded food benefit to replace the CalFresh assistance that these households will lose. Governor Newsom proposes to make this new state-funded food benefit permanent. Building on the federal Affordable Care Act (ACA), California has substantially expanded access to health coverage in recent years. For example, more than 13 million Californians with modest incomes receive free or low-cost health care through Medi-Cal (California’s Medicaid program) — several million more than before the ACA took effect. Another 1.2 million Californians with incomes up to 400% of the federal poverty line — $48,560 for an individual in 2019 — receive federal premium subsidies to reduce the cost of coverage purchased through Covered California, our state’s health insurance marketplace. Despite these gains, around 3 million Californians remain uninsured, health care costs continue to rise, and many people face both high monthly premiums and excessive out-of-pocket costs — such as copays and deductibles — when they use health care services. Calls for creating state subsidies to reduce the cost of health insurance for Californians with incomes between 250% and 600% of the poverty line. Budget documents do not include details about these proposals, such as the structure of the new state subsidies or their estimated costs. Under current law, households with incomes up to 400% of the poverty line are eligible for federal subsidies to reduce the cost of their premiums if they purchase coverage through a health insurance marketplace, such as Covered California. Households with incomes above 400% of the poverty line are not eligible for federal assistance to help make health insurance more affordable. Calls for creating a state requirement for Californians to carry health insurance or pay a penalty. The ACA included an “individual mandate” to encourage young and healthy people to buy health insurance. The goal was to create healthier “risk pools” and keep premiums lower than they otherwise would be if only older and sicker people signed up for coverage. With limited exceptions, people who failed to comply with this requirement had to pay a penalty to the federal government. However, Congress and President Trump eliminated the individual mandate penalty effective January 1, 2019. The Governor proposes to establish an individual mandate at the state level, which would require Californians “to obtain comprehensive health care coverage or pay a penalty,” according to the Governor’s budget summary. The Administration indicates that revenues raised by this penalty would fund the new state subsidies described above. On a conference call with stakeholders, Administration officials suggested that the penalty could raise around $500 million per year. Expands eligibility for comprehensive Medi-Cal coverage to undocumented young adults who otherwise meet the program’s requirements. States are prohibited from using federal dollars to provide comprehensive, or “full-scope,” Medicaid coverage to undocumented immigrants. States, however, may use their own funds to provide such coverage. In 2016, California expanded full-scope Medi-Cal coverage to undocumented children and youth through age 18 who meet all other eligibility requirements, including income limits. The Governor proposes to extend this policy to undocumented Californians who are ages 19 through 25, effective no sooner than July 1, 2019. (This age range may be intended to create parity with other young adults: The ACA requires private insurers that offer dependent coverage to let young adults up to age 26 remain on their parent’s plan.) The Administration estimates that 138,000 undocumented young adults would sign up for full-scope Medi-Cal under this new policy, with a General Fund cost of $194 million in 2019-20. Set in motion a series of steps that are intended to boost the state’s bargaining power in negotiations with prescription drug manufacturers. For example, the order requires the Department of Health Care Services to conduct — by January 2021 — negotiations with drug companies for the entire Medi-Cal program, rather than just for part of the program, as is the current practice. In addition, the Department of General Services (DGS), working with the California Pharmaceutical Collaborative (CPC), is required to “develop and implement bulk purchasing arrangements for high-priority drugs.” The Governor’s order also requires DGS and CPC to create a “framework” to allow small businesses, health plans, and other private purchasers of prescription drugs to negotiate alongside the state with drug companies. The combined market power of public and private purchasers would strengthen their bargaining leverage when negotiating prescription drug prices. Approved by California voters in 2016, Proposition 56 raised the state’s excise tax on cigarettes by $2 per pack and triggered an equivalent increase in the state excise tax on other tobacco products. These increases took effect on April 1, 2017. Prop. 56 requires most of the revenues raised by the measure to go to Medi-Cal, which provides health care services to more than 13 million Californians with low or moderate incomes. Family planning services ($50 million). Mental health services in California are primarily provided by counties, with funding largely coming from the state and federal governments. The Governor’s proposed budget highlights several “emerging challenges” to the mental health system, including a growing demand for mental health practitioners, rising homelessness (a substantial share of homeless individuals struggle with mental illness), and the need for new approaches to detect and treat mental illness as early as possible. $100 million General Fund to provide additional supportive housing services for people who are homeless or at risk of becoming homeless, with a focus on people with mental illness. These funds would be directed to existing Whole Person Care Pilots, which coordinate health, behavioral health, and social services for Medi-Cal enrollees, largely targeting those who are homeless and/or mentally ill.
$50 million General Fund to increase support for mental health workforce programs. This additional funding would be administered by the Office of Statewide Health Planning and Development. $25 million General Fund to improve efforts to “detect and intervene when young people have had, or are at high risk of experiencing, psychosis,” according to the Governor’s budget summary. State policymakers have taken steps in recent years to expand access to full-day early learning opportunities for preschool-age children. Since 2013-14, the state has funded more than 37,000 full- and part-day California State Preschool Program (CSPP) slots for children in low- and moderate-income families. Nearly three-quarters of these slots were for full-day, full-year services. In addition, after passage of the Kindergarten Readiness Act of 2010 (SB 1381), which moved the kindergarten age cutoff from December to September, the state phased in a new Transitional Kindergarten (TK) program in the fall of 2012. Schools can offer either part-day or full-day programs. This new grade is not an expansion of services, but offers a two-year kindergarten experience for children that otherwise would have been very young for their grade. Eligibility for TK is not related to family income. Finally, in 2017 administrators released the results of an evaluation of kindergarten programs that provided much-needed data on the number of districts offering part-day or full-day classes across the state, revealing that about one in five districts only operate part-day kindergarten programs. Full-day kindergarten programs can benefit low-income working parents by providing care for more hours of the day, while potentially offering more educational opportunities for students. Provides $124.9 million General Fund to increase the number of slots in the CSPP. The proposed budget adds 10,000 full-day, full-year preschool slots for community-based organizations. The budget proposal signals the intent to continue expanding the CSPP over the next two fiscal years with the goal of adding a total of 200,000 slots by 2021-22. Shifts $297.1 million in Proposition 98 General Fund for the CSPP to the non-Prop. 98 General Fund. Recent expansion of the CSPP has been directed to Local Education Agencies (LEA), but many LEAs have been unable to serve more children in the program. Shifting funds out of the Prop. 98 General Fund frees up funding for non-LEA providers that have the capacity to serve children not served by LEAs. This also has the intention of simplifying contract funding for these state preschool providers. Eliminates the parental work or school requirement for the full-day CSPP. Currently, the CSPP is a part-day program offered for roughly nine months of the year. Some children receive “wraparound” services that provide subsidized child care for the remainder of the day and throughout the entire year. Eligibility for the part-day program is based solely on family income. To be eligible for the full-day CSPP, families must also demonstrate that they are working or attending school. To make access to a full-day, full-year program easier, the proposed budget eliminates the parental work and school requirement for wraparound child care services. Provides $10 million General Fund to develop a plan to provide universal access to the CSPP. As mentioned in the Child Care section, the budget proposal also includes $10 million General Fund to pay a contractor to create a plan in the 2019-20 fiscal year to address a wide variety of issues such as facility capacity, workforce training, redundancies with TK, access to subsidized child care, and potential revenue options for the subsidized child care and development system. Approved by voters in 1988, Proposition 98 constitutionally guarantees a minimum level of annual funding for K-12 schools, community colleges, and the state preschool program. The Governor’s proposed budget assumes a 2019-20 Prop. 98 funding level of $80.7 billion for K-14 education, $2.3 billion above the 2018-19 funding level of $78.4 billion estimated in the 2018-19 budget agreement. Based on projections in the Governor’s proposed budget, the 2018-19 Prop. 98 funding level dropped by $525.7 million to $77.9 billion from the estimated level in the 2018-19 budget agreement, and the 2017-18 Prop. 98 funding level dropped by $120.1 million to $75.5 billion. The Governor’s proposal would change statutory language to specify that the state may not adjust Prop. 98 funding levels for any non-certified year outside of the current year or budget year (i.e. for the 2019-20 proposed budget, current year refers to 2018-19 and budget year refers to 2019-20). Moreover, after referencing legal challenges to changes in the certification process, the Governor’s budget summary states that to provide more certainty he proposes prohibiting the state from adjusting Prop. 98 funding levels for a prior fiscal year and eliminating the cost allocation schedule. Under this proposal, when the final Prop. 98 guarantee ends up lower than estimated the state would not be able to adjust the Prop. 98 funding level downward. However, in years when the final Prop. 98 guarantee ends up higher than estimated the state would be required to adjust the Prop. 98 funding level higher to meet the constitutional funding requirement. The overall effect of the Governor’s proposal would shift the risk associated with the uncertainty in the annual Prop. 98 guarantee from K-12 school and community college districts to the state. Increases LCFF funding by $2.0 billion. The LCFF provides school districts, charter schools, and COEs a base grant per student, adjusted to reflect the number of students at various grade levels, as well as additional grants for the costs of educating English learners, students from low-income families, and foster youth. The Governor’s proposed increase reflects a 3.46% cost-of-living adjustment (COLA) and would result in $63 billion in total LCFF funding. The Governor’s budget also provides $9 million to fund a 3.46% COLA for COEs. Last year’s budget agreement included a provision that would appropriate LCFF dollars to K-12 school districts even if the Legislature does not act and, further, automatically adjusts this appropriation for increases in the cost of living and for changes in enrollment. The Governor’s proposed budget would “create a cap on increases to LCFF related to the continuous appropriation of LCFF COLA,” which would reduce the financial risk to the state budget if the COLA for LCFF and other programs exceeded growth in the annual Prop. 98 minimum funding guarantee. Provides $576 million, including $186 million in one-time dollars, to support expanded special education services. The Governor’s proposal would provide grants to school districts with large shares of students with disabilities and other disadvantaged students — English learners, students from low-income families, and foster youth — to supplement services for students in special education programs and for preventative services. Provides $187 million to fund COLAs for non-LCFF programs. The Governor’s proposed budget funds a 3.46% COLA for several categorical programs that remain outside of the LCFF, including special education, child nutrition, and American Indian Education Centers. Increases COE funding by $20.2 million to provide assistance to school districts. The Governor’s proposed budget includes funding for COEs to help address low student achievement in school districts identified by the state’s accountability system as needing support. Provides significant funding increases for Promise Program. The California College Promise Program provides state funding to community colleges to improve college readiness, increase completion rates, and close achievement gaps. The Governor’s 2019-20 budget proposal increases funding by $40 million — the amount needed to extend the California College Promise to a second year of tuition-free college for first-time, full-time students. The proposal also allocates $5 million in one-time funding for outreach related to the Promise Program. Revises implementation of the Student Centered Funding Formula. The 2018-19 budget created a new funding formula for CCC general-purpose apportionments. The Governor’s proposed budget revises the implementation of the formula including maintaining current funding rates for the student success allocation, capping the student success allocation year-over-year increases to 10%, and clarifying how the transfer student outcome measure is defined. Provides $26 million for enrollment growth. Provides an increase of $10 million for legal services for undocumented immigrant students, staff, and faculty on CCC campuses. Does not provide funding to address students’ food and housing needs. California supports two public four-year higher education institutions: the California State University (CSU) and the University of California (UC). The CSU provides undergraduate and graduate education to roughly 481,000 students on 23 campuses, and the UC provides undergraduate, graduate, and professional education to about 273,000 students on 10 campuses. Increases ongoing funding for the CSU by $300 million. The budget proposal includes $193 million for operational costs, $62 million for a 2% enrollment growth (7,000 students), and $45 million for the Graduation Initiative, which seeks to improve graduation rates and eliminate opportunity and achievement gaps. Proposes $15 million one-time funding for the Basic Needs Initiative. The Basic Needs Initiative addresses students’ food and housing needs by providing short-term emergency housing, financial assistance, food pantries, and assistance connecting students with resources. Allocates $7 million to support legal services for undocumented immigrant students, staff, and faculty at the CSU. Provides $2 million in one-time funding to undertake a review of a potential CSU campus in San Joaquin County. Provides $250,000 for Project Rebound, which supports formerly incarcerated individuals. Increases ongoing funding for the UC by $240 million. The Administration’s proposal includes $119.8 million for operational costs, $49.9 million to improve degree attainment and student success, $15 million to address food and housing insecurity, $10 million for enrollment growth of 1,000 additional resident students, $5.3 million for student mental health programs, and $40 million for Graduate Medical Education that was previously supported by Proposition 56 funds. Provides $15 million one-time funding for UC extension centers. The Administration intends for the extension center to provide outreach and degree completion support to students who have some college credits but no degree. Allocates $1.3 million to support legal services for undocumented immigrant students and their families, beginning in 2022-23. The Administration notes that the 2018-19 budget allocated sufficient funding to sustain legal services for undocumented students through 2021-22. Provides $121.6 million to increase Cal Grants for students with dependent children. The spending plan proposes supporting CSU, UC and CCC students with dependent children by increasing the Cal Grant B Access award from $1,648 to $6,000, awarding new or renewal Cal Grant A students with an access award of up to $6,000, and increasing the Cal Grant C book and supply award from $1,094 to $4,000. Increases funding for Competitive Cal Grant awards by $9.6 million. Competitive Cal Grants support students who attend college more than a year after high school graduation and meet certain income and GPA requirements – awards are limited to 25,750 students, though more than 340,000 qualified for them in 2017-18. The budget proposal increases the number of awards available to 30,000. Education data can be a powerful tool for policymakers, educators, parents, and other stakeholders in measuring outcomes and informing decision making. The Governor’s budget summary notes that California’s education data are currently housed in multiple databases operating under differing legal and regulatory requirements. The budget proposal provides $10 million one-time General Fund for a statewide longitudinal “cradle-to-career” data system for early education, K-12 education, and postsecondary education in California. This funding will support both the planning of the data system and initial implementation. The proposed budget would add California to the list of 16 states that currently have a data system that tracks students from preschool through their college degree. Currently, more than 127,000 adults who have been convicted of a felony offense are serving their sentences at the state level — down from a peak of around 173,600 in 2007. Most of these individuals — about 114,200 — are housed in state prisons designed to hold slightly more than 85,000 people. This level of overcrowding is equal to 134.1% of the prison system’s “design capacity,” which is below the prison population cap — 137.5% of design capacity — established by a 2009 federal court order. (In other words, the state is in compliance with the court order.) In addition, California houses over 13,100 people in facilities that are not subject to the court-ordered cap, including fire camps, in-state “contract beds,” out-of-state prisons, and community-based facilities that provide rehabilitative services. The sizeable drop in incarceration has resulted largely from a series of policy changes adopted by state policymakers and the voters in the wake of the federal court order. Anticipates that all Californians housed out-of-state will be returned to California by June 2019, rather than January 2019 as assumed in the 2018-19 budget package. Nearly 2,000 Californians are housed in Arizona because there is no room for them in state prisons, given the court-imposed prison population cap. Provides $12.6 billion for the California Department of Corrections and Rehabilitation (CDCR) in 2019-20, which is roughly equal to 2018-19 spending. Nearly all support for the CDCR comes from the General Fund. Estimates that Proposition 47 will generate net state savings of $78.5 million in the current fiscal year (2018-19). Approved by California voters in 2014, Prop. 47 reduced penalties for certain nonviolent drug and property crimes from felonies to misdemeanors. Annual state savings from Prop. 47 are allocated as follows: 65% to mental health and drug treatment programs, 25% to K-12 public school programs for at-risk youth, and 10% to trauma recovery services for crime victims. Projects that the average daily adult population of adults incarcerated at the state level will decline by 1.1%, from 128,334 in 2018-19 to 126,971 in 2019-20. Includes a total of $10.7 million over the next two years to expand the Board of Parole Hearings staff. This expansion reflects increased workload related to “parole suitability” hearings for people serving indeterminate life sentences under the state’s “Three Strikes” law. A recent court ruling found that the state had erred in initially excluding these individuals from the parole hearings required by Prop. 57 of 2016. Provides $5.5 million to help improve literacy rates among incarcerated adults. Includes $576,000 to initiate a study of California’s complex Penal Code. The California Law Revision Commission would lead an effort “to simplify and rationalize criminal law and criminal procedures included in the Penal Code,” according to the Governor’s budget summary. California has the largest share of immigrant residents of any state, and immigrants make up a third of the state’s workforce. The Administration notes that conditions in Central America together with “inadequate federal immigration policies” have caused a “humanitarian crisis” at California’s southern border. To address this challenge, the Governor proposes allocating $25 million (with $5 million available in the current 2018-19 fiscal year, and the remaining $20 million available over the next three fiscal years) for an “immigration rapid response program,” which would support the work of nonprofit and community-based service providers that are responding to immigration-related emergencies. The Governor’s budget also allocates ongoing annual funding for legal services for immigrants to assist individuals with applications for Deferred Action for Childhood Arrivals (DACA), naturalization, deportation defense, and other immigration remedies. These funds include $58 million for the Department of Social Services, as well as $7 million for the California State University (CSU) and $10 million in Proposition 98 funds for community colleges to support legal services for undocumented immigrant students, staff, and faculty in each of these systems, maintaining the increased funding levels for these items adopted in the 2018-19 budget. The Administration notes that funding provided in the 2018-19 budget for similar services at the University of California (UC) is “sufficient to support the UC’s legal services program through the 2021-22 fiscal year,” and proposes allocating $1.3 million ongoing for these services at UC beginning in 2022-23. As mentioned above, the Administration also proposes to extend Medi-Cal eligibility to undocumented immigrant young adults ages 19 to 25 (adopting a proposal put forth by the Legislature last year). The decennial census is an important tool that provides indispensable social and economic data about the state and the country. The census count also determines how federal dollars are distributed to states and how many seats each state has in the House of Representatives. It is in California’s best interest to ensure that the 2020 Census is as accurate as possible, a goal reflected in the Governor’s proposed funding for census outreach, awareness, and coordination. There are a number of issues that raise concerns about the 2020 Census. First, federal funding for the 2020 Census has not been adequate to fully prepare for the count. Second, the US Census Bureau has significantly changed the way in which it plans to administer the 2020 survey, and the agency will be hiring far fewer field workers to follow up with households who are late to respond. Third, the Trump Administration has announced that it will be adding a citizenship question to the Census, which could depress response rates given the administration’s virulent attitude toward immigrants. The Governor’s proposed budget includes an additional $50 million to support statewide efforts to increase participation in the 2020 Census, bringing total state support for this effort to $140.3 million. Last year’s budget provided $90.3 million in state funding to support the California Complete Count Committee, which oversees census outreach, awareness, and coordination efforts — particularly for hard-to-count residents. The committee was created after the undercount of the state’s population in the 1990 decennial federal census. This undercount likely resulted in California losing a seat in the US House of Representatives as well as about $2 billion in federal funding over a 10-year period. The proposed budget also includes $4 million for the California Housing and Population Sample Enumeration, which is a survey that will identify barriers to a complete census count and outreach strategies that can improve the count. This survey is intended to help inform recommendations for the 2030 Census. After the unprecedented wildfires that devastated California communities in 2018 and other recent years, the Governor’s budget proposes several new investments to improve the ability of the state and local communities to prevent, prepare for, and respond to the natural disasters that are becoming ever more frequent. $20 million in one-time funding under the California Disaster Assistance Act to repair or replace public property damaged or destroyed in a disaster and to reimburse local governments for the costs of emergency response activities. $9.7 million for technology improvements. To offer relief to communities affected by wildfires, the proposed budget includes $31.3 million to compensate cities, counties, and special districts for property tax revenue losses incurred between 2019-20 and 2021-22 as a result of wildfires in 2018 and previous years. Property tax revenue losses to school districts, expected to total $19 million in 2019-20 from 2018 wildfire damage, will be backfilled through Proposition 98. The state would also waive the share of debris removal costs that local governments are generally responsible for and backfill whatever costs are not covered by the federal government; the Governor’s proposal estimates the local cost share for the November 2018 wildfires to be $155.2 million. Finally, the Governor proposes to permanently authorize the Director of Finance to immediately access funds in the Special Fund for Economic Uncertainties (SFEU) for disaster response and recovery efforts, as the Director’s temporary authorization expired at the end of 2018.